Or view larger version. Untitled. 1906. Unknown photographer (hand written on the photo; “copyrighted 1906 by C. P. Magagnos Alameda, Cal”). Photograph. Collection of Oakland Museum of California. Gift of Mrs. Ralph Newell. 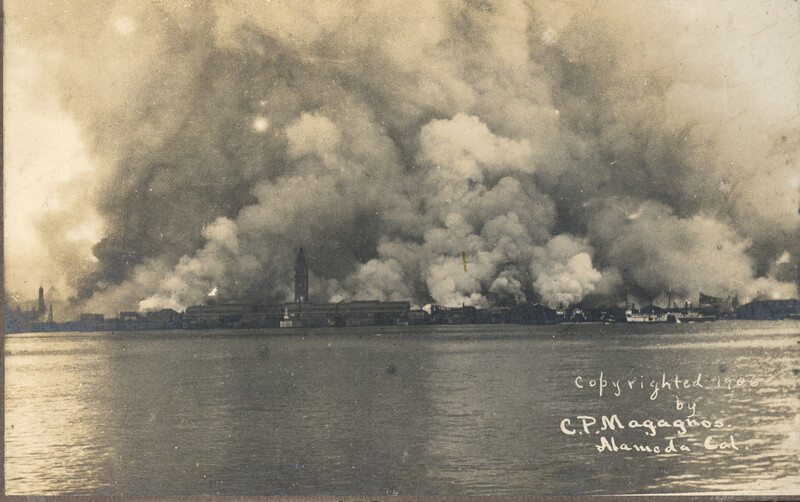 This photo shows the city of San Francisco from East Bay, burning after the 1906 earthquake. The strategy used by the fire chief, John Dougherty, doomed the city. He instructed his crew of fire fighters as well as Army personnel to dynamite buildings to create firebreaks. Rather than contain the fire, the use of dynamite only added to the problem by feeding a fire that burned for three days.